The United Arab Emirates is an Arabian Peninsula nation situated along the Persian Gulf. Consisting of seven emirates, the UAE is populated by over 9 million people. Famed for its glamourous shopping malls, lavish lifestyle, incredible architecture and pristine beaches. Popular attractions in the UAE include Burj Khalifa in Dubai and Sheikh Zayed Grand Mosque in Abu Dhabi. Indulge in cosmopolitan flair and enthralling landmarks because cheap flights to the UAE are now available! The country’s hub airport is Dubai International Airport (DXB), a 15-minute drive from the centre of Dubai. From historical landmarks like the Bastakia quarter and the Ottoman-inspired Al Badiyah Mosque, to human-engineered masterpieces, like Burj Khalifa and Palm Islands sprung out of the desert, the UAE’s landscapes are peppered with artistic design. 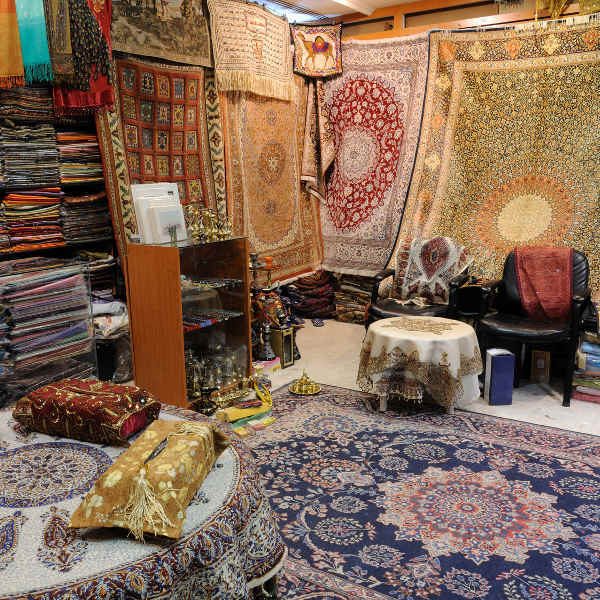 Meander through the perfume-filled souks bursting with rich fabrics and antique treasures. A more sophisticated shopping experience will lead you through the stylish Dubai Mall - where opulence and entertainment await. Take the family on a whirlwind of adventures with a wild choice of theme parks and water parks at your fingertips. 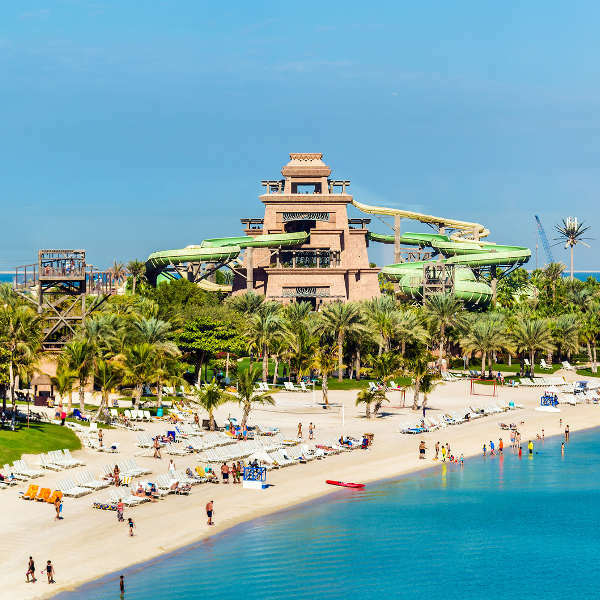 From indoor ski slopes and motorsport circuits, to exotic zoos and sand boarding, the UAE offers never-ending adventure! The most popular time to visit the UAE is between November and March when the cooler ‘winter’ weather makes outdoor activities much more favourable. Rainfall occurs in the form of short outbursts that clear away quickly, so feel free to browse the museums and shopping malls before heading back to the beach. Activities like snorkelling and kayaking are popular at this time, but be prepared for tourist crowds and overpriced accommodation. Summers are brutal with temperatures rising to a sweltering 40°C between June and August. Outdoor activities are very uncomfortable, but shopping malls, hotels and all major buildings and transport modes are air-conditioned. Make sure you stay well-hydrated and wear plenty of sunscreen when outside. On the upside, hotel prices and airfares are significantly cheaper and you’ll have the pearly-white beaches and golf courses all to yourself! You may be able to catch shoulder-season discounts in April and September, just before and after the tourist rush. The dates for Ramadan change annually, so check ahead of time should you wish to avoid travel over this period. Most restaurants close during the day but food is still served in hotels. The Eid celebrations, marking the end of the Ramadan fast, see the streets abuzz with festive hype and activity. Other exciting events held throughout the UAE include the Dubai Shopping Festival in January, the Abu Dhabi Film Festival in October and Dubai Food Festival in February. The UAE exudes opulence, glamour and sophistication, where visitors indulge in the finer things in life. With its awesome skylines, ingenious architecture, insightful museums and varied landscapes, the UAE has much to offer the curious traveller. Abu Dhabi is the island capital, home to the expertly-designed Sheikh Zayed Grand Mosque, a beautiful blend of modern style and ancient Islamic architecture. Abu Dhabi is a gateway to exploring the rolling desert landscapes, where adventure awaits in the form of dune-buggy trips, sand boarding and camel trekking. Experience the desert’s sheer beauty with Bedouin-style dinners under the sparkling, breathless night sky. Grab your racing gear and swimsuit and head down to Yas Island to check out Ferrari World and Water World. Dubai is the lavish business capital, where shimmering stretches of coastline, fine dining and extravagant shopping malls are the order of the day. The landmark skyscraper, Burj Khalifa, boasts the highest observation deck in the world, while Palm Islands and Jumeira Beach are where the rich and famous like to kick back and relax. For a one-of-a-kind shopping experience, browse the world-famous souks in the Deira district; while the Bastakia quarter is a slice of historical Old Dubai. History-enthusiasts should visit museum-filled city of Sharjah, where the Museum of Islamic Civilisation, Sharjah Fort and the diverse Sharjah Arts Museum are well-worth seeing. The shimmering Al Jahili Fort is one of Al Ain’s landmarks and forms the gateway from where to explore the sweeping rocky range of Jebel Hafeet. Frolic along the pearly-white beaches of Fujairah – home to the luminescent Fujairah Fort and Al Badiyah Mosque, the oldest mosque in the UAE, built in 1446 AD. Add a unique tweak to your Arabian adventure and see some camel racing in Ras Al Khaimah where you can soak off in the Khatt natural sulphur springs. Compare several airlines, and book your cheap flights to the UAE online at Travelstart! The cities throughout the UAE are generally very safe with no violent crime known to occur towards tourists. The locals are very charming and outgoing, just be aware of well-dressed ‘businessmen’ trying to lure you into a scam. Watch out for petty theft around crowded areas. The UAE is governed by Islamic law and tourists are expected to behave accordingly. Dubai and Abu Dhabi have a fairly liberal dress code and tourists are permitted to wear swimsuits and bikinis on the beach and at hotel pools. However, moderate dress, especially for women, should be considered at all times in respect of local customs. Alcohol consumption in public spaces is illegal and you should always carry some form of ID if you plan on visiting bars and nightclubs. Avoid discussing politics and showing public displays of affections – this could lead to imprisonment or deportation. Feel free to photograph tourist attractions, but it is considered polite to ask before photographing someone, particularly women. The major cities have excellent medical facilities, but medical care can work out costly. If carrying prescription medications, label it clearly and have a prescription letter. A comprehensive travel-insurance policy to cover theft and medical expenses is strongly recommended.